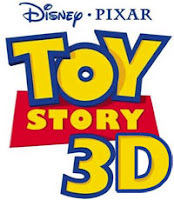 The original TOY STORY (1995) and TOY STORY 2 (1999) are coming to theaters as a 3-D double bill starting October 2, 2009. The double bill will run for just two weeks. Click the title of this post for the (very cute) teaser trailer for the 3-D releases. I'd like to try to see these. I have fond memories of seeing each of these films in theaters during their initial releases. TOY STORY 3 has a release date: June 18, 2010. Michael Keaton is joining the cast as the voice of Barbie's boyfriend Ken. Jodi Benson (THE LITTLE MERMAID) returns as Barbie. My whole family is looking forward to this one.